A trend in the communications space is the elimination of analog telephone lines, or plain old telephone service (POTS). Here's the breakdown of what you need to know during this transition and information on Kings III's cellular solution. As an emergency communications provider, we spend a lot of time thinking about how to best meet the needs of our clients, often stemming from technological developments and always focused on service. The use of landlines is becoming fewer and fewer with early adopters being in the business environment and specific to our customers, in the storage, commercial office and multifamily residential space. As the trend continues, you may ask yourself, what are my options? As reported by James Grahame of Retro Thing, AT&T declared POTS (plain old telephone service) lines and the PSTN (public switched telephone network) which are over 100 years old “relics of a bygone era” and in a letter to the FCC requested permission to phase out its analog service. But what does that really mean and where does that leave you, the consumer? First, let’s define terms. What is a POTS line and what is the difference between analog, digital, cellular, mobile, wireless and VoIP? POTS or analog lines service the PSTN by making a connection through copper wiring by transmitting voice signals into electronic signals or pulses. It has been the standard system across the globe since the 1880s and is very reliable. Think telephone poles strung with wires. Digital lines connect through digital cabling. Using radio waves, voice signals are compressed into binary code or bits. Although it provides better sound clarity, the data may not be as accurate as analog since it is dependent on how much information is transmitted. That means it must guess at what data is missing. This is why many music fans prefer vinyl (analog) recordings to digital. VoIP (voice over internet protocol) converts analog signals to digital via the internet. While VoIP is a commonly sought after solution in the business environment, we do not recommend using VoIP for your emergency phones – learn more details here. Mobile simply means a portable device that requires an internal battery for power. Your iPhone is a mobile device. Wireless does not mean mobile (portable) but rather refers to the network such as a local area network (LAN) which uses a router to make what was once a cabled connection wireless or wide area network (WAN) which uses 3G or 4G technology. Cellular is a two-way radio connection over a network where the last link is wireless. Clear as mud, right? Profits from POTS lines have been steadily declining and with new technologies it doesn’t make sense to invest more money in what is becoming an outdated system – we certainly cannot blame the telecommunication giants for their logic here. However, the advantages of analog have traditionally been two-fold. First, you can maintain service when your power goes out. Secondly, 911 is able to easily identify where you are calling from. So when thinking about emergency communications, isn’t a POTS line the best choice? Not necessarily and that’s where Kings III has you covered - regardless of what technology you are using. 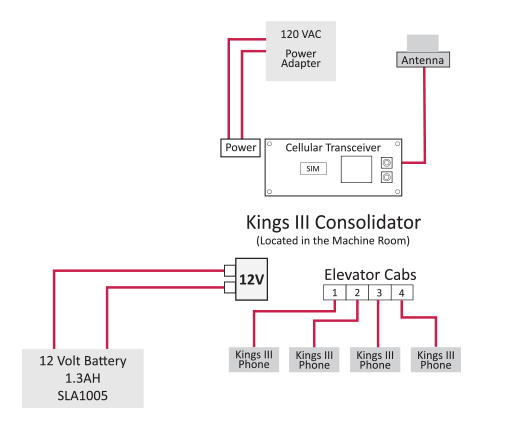 The Kings III smart line seizure technology enables true two-way communication of multiple emergency phones on a single existing analog or digital line. Our unique line consolidating dialer party-lines all phones together enabling simultaneous two-way communication between each elevator cab and our Emergency Dispatch Center. As each phone is activated it sends an identifying signal, allowing our operators to locate each caller to the specific cab as ADA requires. Here at Kings III, we refer to our turnkey cellular solution as Skyline. Kings III Skyline leverages cellular networks and eliminates a dependency on traditional POTS lines or VoIP as well as the need to sign up with a carrier. Utilizing the buildings existing copper wiring and a 120v ac outlet (with battery backup), this two-piece option uses a traditional ADA compliant handsfree phone in the elevator cab and a cellular transceiver located to achieve optimal signal strength outside the elevator shaft. What’s more is we have confirmed historically our Emergency Dispatch Center receives calls faster using the Skyline system and has proven more reliable in a natural disaster. Are customers responsible for providing the cellular line? No. Kings III provides cellular signals. We have agreements with multiple carriers eliminating your need to deal with someone else for phone lines-- often at a lower cost than you would find if you were to buy the line yourself. This is a turnkey solution where we provide the hardware and access to the cellular signal, no need for the client to go sign up with a wireless carrier for another monthly bill. Yes, while we typically think of cellular and wireless as interchangeable, that is not the case for emergency phones. While the signal enters the building in a “wireless” fashion, there is copper wiring required to connect the dial tone all the way to the elevator cab. This is probably the most common misconception we see. What if there is no existing wiring from the machine room to the elevator? If a short distance (roughly <75 feet), we can generally run that wiring for you. If a longer distance or some other special circumstance, we will reach out to you to hire a structured cabling contractor. Because our business is focused on life safety, we recognize the importance of having a signal. We test coverage before installation, and can also remotely locate the cellular transceiver away from the phone (if necessary) to achieve the best signal strength. How does the speed of transmission compare to traditional landlines? We have noted that our Emergency Dispatch Center receives calls faster using our Skyline cellular system and has proven more reliable in natural disasters. Kings III offers an emergency help phone solution that universally benefits all types of properties in both the commercial and residential space. While our offering remains the same, the way we customize, install and implement our solution is not a one size fits all. Quite the contrary, we work to execute our service in a way that makes the most sense for our customers and their properties. In addition, our 24/7 emergency monitoring, lifetime warranty and maintenance service are values you won’t find anywhere else.